Are you seeking volunteer opportunities to discover the joy of giving back to our community? Here is the chance. 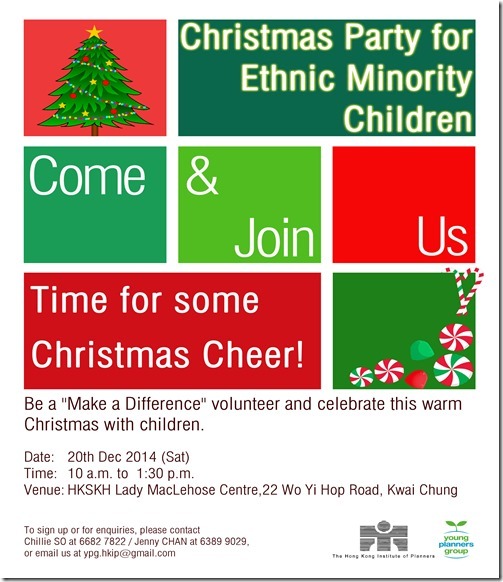 The Young Planners Group (YPG) cordially invites you to be a “Make a Difference” volunteer and to celebrate this warm Christmas with ethnic minority children from the HKSKH Lady MacLehose Centre. Required Skills: Be loving, enthusiastic and come with a big smile! To sign up or for enquiries, please contact Chillie So (6682 7822) / Jenny Chan (6389 9029), or email us at ypg.hkip@gmail.com.